- Several children gather items to use in the construction of a makeshift roller coaster starting on the roof of a house; two children test the coaster and speeding down a ramp, over a fence, down a flight of stairs, through a garage door just as it opens, and they are thrown off the track and onto a busy street, nearly struck by a truck and careening through an intersection and they crash through a few fences through before coming to a stop (there are no injuries, but a lot of property damage that the parents of the girl are shown to be paying). A girl imagines her father alone at home, slipping on golf balls and breaking his leg, putting a fork in a toaster causing smoke to fill the house and drinking spoiled milk from a fridge filled with cawing crows. We see many stuffed monkeys tearing apart an amusement park and feeding the pieces into a large, dark cloud spinning overhead. A girl swings on a rope and flings herself into a dark swirling cloud where she jumps across items inside it, she finds a monkey inside the cloud and they get out by sliding through bendy straws. 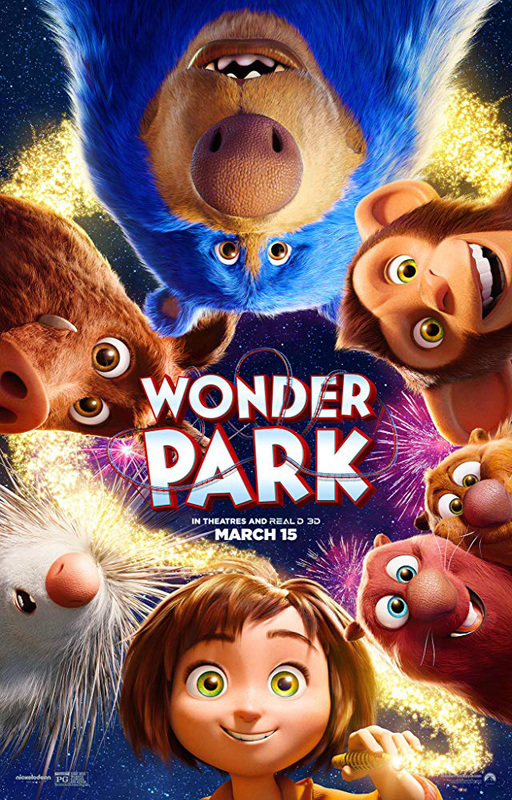 ► Several animals and a girl hold a licorice rope across a track trying to stop a speeding roller coaster car carrying a bear; the car is thrown off the track and all of them are thrown through the air and get caught up in ropes wrapped in a tree (no one is harmed). Animals and a girl stand on a high platform as fireworks explode around them (we see flashes and sparks around them), the platform begins to break apart and the animals scatter; the girl falls and clings to a beam, then grabs a rope but loses her grip and falls toward rapids below until an animal throws a large umbrella to her and she uses it to float on the water and eventually to safety. A girl falls through a hole in the ground and into "zero gravity land" where she floats and catches a bubble that she rides. An amusement park ride with large mechanical arms throws spheres at animals and a girl as they run away; one animal is thrown when struck (it's OK), another hangs from the ball off the ground (it is a hedgehog and its tines are stuck in the ball). A girl runs away from a bus taking children to a math camp, she runs through a forest chasing a piece of paper flitting in the wind, and she stumbles and tumbles a few times before finding a hidden roller coaster car buried by brush; the car rolls on a track when she climbs in and leads her toward an abandoned amusement park speeding down a severe drop until the car stops upside down on a loop-di-loop and the safety bar opens dropping the girl into trees below (she's OK). A girl rides in a flying fish car and dodges large mechanical arms that try to catch her. A bear collapses and wakes up in a roller coaster car at the top of a tall drop off, a bird lands on him and pecks him causing him to roll backward down the track fast as he screams. Beavers chew the wood of a roller coaster scaffold to redirect the track (we see the track fall). A hedgehog attaches a licorice rope to his tines and shoots it a great distance (it sticks into a tree). ► Several animals run in fear while being chased by "Chimpan-zombies" (they are stuffed monkeys that destroy things using weapons as they chant maniacally and they move in large swarms), and one animal says, "We're at war." A hedgehog leads a swarm of Chimpan-zombies into an empty rocket and launches it into the air. Many "Chimpan-zombies" chase a girl and a monkey and circle the monkey carrying it away. A hedgehog gets plastic water bottles stuck in its tines. ► A girl yells at a woman and throws a notebook in a fireplace; we see the pages in flames as she tries to grab it but is pulled back and she cries. A woman seems to be getting very sick and we see her coughing and seeming fatigued in a few scenes eventually telling he young daughter that she will be going away for treatments. In an imaginary amusement park, people climb into large spheres that are then picked up by a mechanical arm and flung through the air, landing safely on the other side of the park. ► When falling asleep uncontrollably a bear slams its large paw down on a hedgehog; both yell and scream and we see the bear with tines in its paw. Two beavers slap each other repeatedly in several scenes. A dog is shown biting a postal person's delivery bag. A young girl runs after the car taking her mother away to get treatments for an unidentified illness. A woman pinches a girl's cheeks when she greets her. A girl reluctantly goes to math camp. ► A boy tells another boy, "You chucked yuck." A character says, "We're at war." A character says, "The darkness came." A character talks about a park having an "existential crisis." A man tells his young daughter to, "Get out there and skin a knee." ► A boy on a bus complains of not feeling well and pretends to vomit as he pours a bag of green goo on the floor of the bus; the bus pulls over and the occupants rush out. A boy spins around on a front yard, dizzy from a previous activity that we do not see and eventually falls to the ground. A bear says he suffers from "late onset hibernation disorder" and he falls asleep uncontrollably. - Adventure, imagination, experimentation, inspiration, family, life threatening illness, medical treatments, team work, wonder, being safe, over-protectiveness, caution, fear, giving up. - Never give up. Darkness is always around but we need to focus on the light that's around us.